Arrow's Walkers- breeders of the first TWH double-agouti perlino in Colorado. 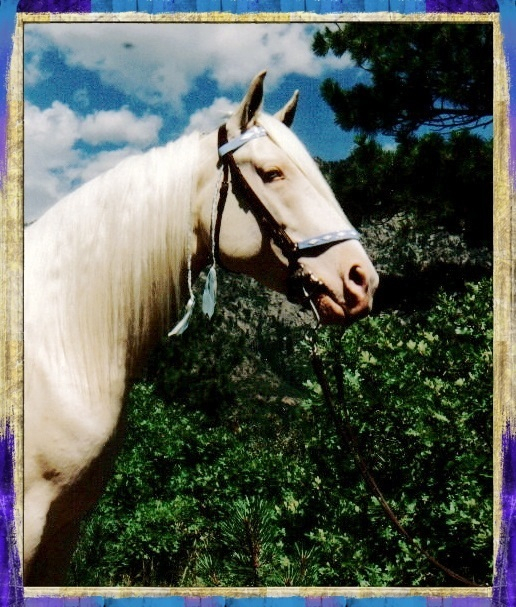 Blue Gold, cremello stallion. Our introduction to color genetics came with the purchase of our foundation stallion, Blue Gold. Blue was one of the first double-dilute TWH stallions to stand out west. Please come back for a visit as I will be adding pictures of double dilutes to this page and also some information on color genetics. On the subject of color genetics, color is always the icing on the cake. We feel that you build the layers of the cake with your incompromisable genetic traits- strong feet, legs, and overall comformation, disposition, gait, fluidity of movement, etc. You can compromise on color, but why? Why not have it all- a talented well built horse in the color of your choice.